New at CEA Instruments, Inc. Please contact us for more information on any of our products. SB1000 & SB2000 - The new SB1000 & SB2000 are low cost, self-contained portable and wall mounted analyzers that utilize single beam infrared technology for a wide range of gases, ranges, and applications to provide high selectivity, excellent sensitivity, and repeatability. Full-scale measurement ranges are typically available from 0-1% up to 0-100% volume. One optional internal electrochemical sensor for Oxygen, Hydrogen Sulfide, or another toxic gas in PPM levels can also be installed in any unit. These single gas analyzers then become dual gas analyzers. The resolution and accuracy is about 1% resolution of full scale for any of the sensors in these analyzers. Specialized advanced analyzers are also available that offer additional capabilities if more is required than these units can provide. This includes multi-channel infrared analyzers all in one enclosure, low PPM detection of infrared gases, and/or 0.1% resolution of full scale. GD-888 SERIES - AC/DC portable Carbon Dioxide analyzers for ranges of 0-10,000 ppm (1%), 0-10% Volume, or 0-100% Volume with a backlit LCD display, built-in air pump, push button controls, adjustable alarm, recorder output, and a battery charger that is also the continuous AC power supply. The rechargeable batteries allow for several hours of portable usage between charges. The optional external datalogger can store up to 40,000 readings along with time and date using easy WindowsTM software. 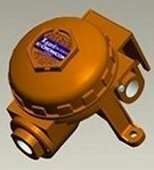 GASMAN - Gasman replaces the original Gasman and Gasman II units setting new standards for personal gas monitoring of flammable, oxygen and toxic gases. This version is the lightest and lowest cost but is also the most advanced, flexible, durable, and compact! Designed for use in the toughest environments, Gasman offers an unbeatable combination of powerful loud, bright, and internal vibrating alarms. Together with its rugged impact resistant construction and compliance to IP65 and IP67, Gasman is the ideal choice for personal monitoring in demanding industrial environments. XGARD SERIES - The Xgard Series has been specifically designed to meet the requirements of dangers presented by toxic and flammable gases as well as oxygen deficiency which vary with each application for wall or ceiling mounting without the need for additional brackets. The Xgard Series offers four different sensor concepts so you can choose exactly what you need for your site and are available either in flameproof, intrinsically safe or safe area formats for use in all environments no matter what the classification. Xgard is constructed from highly durable marine-grade aluminum with tough polyester coating designed to operate even in the harshest conditions with spray deflectors and weatherproof caps available for use in offshore environments or areas subject to regular wash-downs. Accessories are available for duct mounting, sampling applications, and remote gassing for simple sensor checking. LINKS FOR MORE CEA INSTRUMENTS, INC.